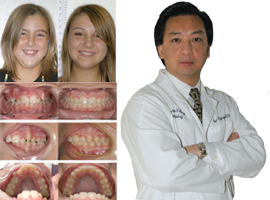 Your dentist uses the most advanced orthodontic tools, to provide you with the highest levels of orthodontic treatment. Instead of a “one size fits all” approach used in typical straight wire appliances, your dentist customizes your braces and wires. Since the braces have been specifically made for you, faster and more effective treatment can be expected. Customized — IP Orthodontics gives dentists 10 times more bracket and archwire designs to choose from, creating a treatment-specific set of braces. Each tooth is diagnosed to find the best bracket for the intended direction of tooth movement. Your braces will be designed and made for you. Faster Treatment — Treatment with the IP Appliance® has been shown to be at least 6 months faster than the current straight archwire appliance treatment. Since treatment time varies significantly by severity, age and anatomy, speak with your dentist to get a better projection on your treatment time. Fewer Treatment Visits — Due to the use of long-acting materials and the reduced need to make archwire corrections, intervals between visits can be extended. This means less travel and time in the dentists’ chair, with better results. More Comfort — Since your braces and wires are customized to you, you have less wire changes, pain and irritation. Better Smiles — IP Orthodontics’ diagnosis compensates for unwanted tooth movements. Computer aided diagnosis accurately predicts your teeth’s path to its final position, shortening your treatment time and reducing unexpected tooth movements. Improved Retention — Retention has improved significantly by straightening the teeth more effectively, earlier in treatment. Customized brackets specific to each tooth’s rotation are applied to fully straighten your teeth. Since your dentist does not need to make as many archwire compensations throughout the treatment, your teeth are straightened to their final positions earlier and have improved capacity to retain in that position. Individual Patient brackets may look the same as others. But upon closer inspection, the specific customized design for your most efficient and effective tooth movement can be seen.